pink and green Easter finery. I had to borrow them and allow them to be the stars of the show. Pink and green make me happy happy! Pink goblets are Rosanna, purchased on Amazon. They are a new purchase and I love them! Here are the lovely ladies now! The ladies are so thrilled that you visited them today. This is so cute, Gina...the lovely ladies are really stealing the show! Everything looks so sweet, I love it! Thanks for the reminder I must find my bunny like!! Oh how cute. Love those colors together. The bunnies do steal the show. Turned out lovely, Gina. As usual. Lovely colors. I've decorated in pink and green a few years ago... still dtermined in going B&W this year but so little ideas and even less time to put them in practive. Happy Easter Dear Gina! May it be a Blessed one. Look at that pretty in pink and green table! Your mix of dishes and flatware is so fun, Gina! The stars of the show deserve to be the centerpiece!! Aren't they cute?? I love it all!! Too Cute!! I especially love the mixed flatware, just those extra little details that make a table over the top! Adorable tablescape! I love those pink goblets too, very pretty! Such a lovely table. Thanks for sharing the sources for your beautiful pieces. I love the green flatware...and Home Goods. They match your table perfectly, Gina! Such a pretty table. I love pink and green together, too. Gina, the lady bunnies are as lovely as they sounded in your title. 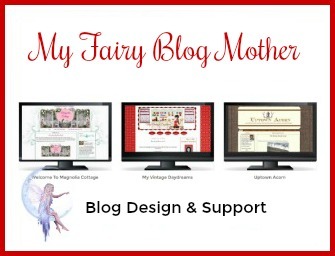 Love the colors and everything looks perfect for fun for a lady of any age! Thanks for sharing it. Glad to see you at Maria's party tonight! How adorable! 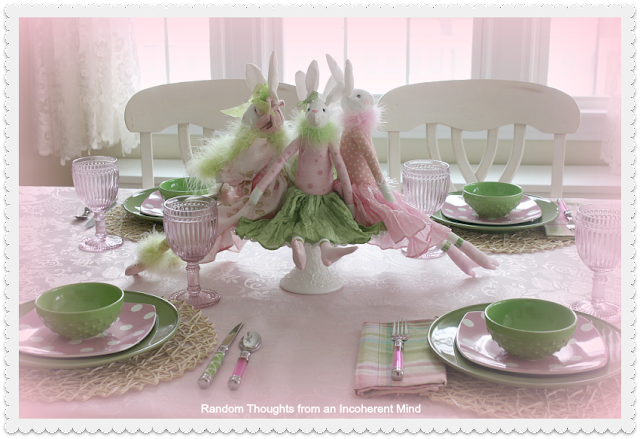 I love your tablescape and the bunnies are make the cutest centerpiece! Visiting over from Tuesday at our Home. Hi Gina! 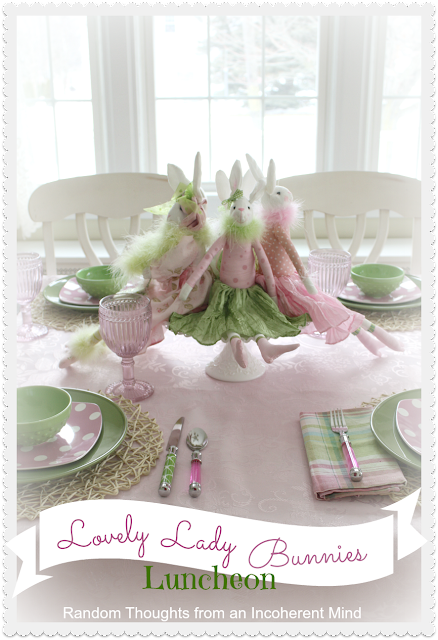 Oh, what precious little lady bunnies and your table is so pretty! Love your dishes and the colors. Okay, I don't think this could get any cuter! 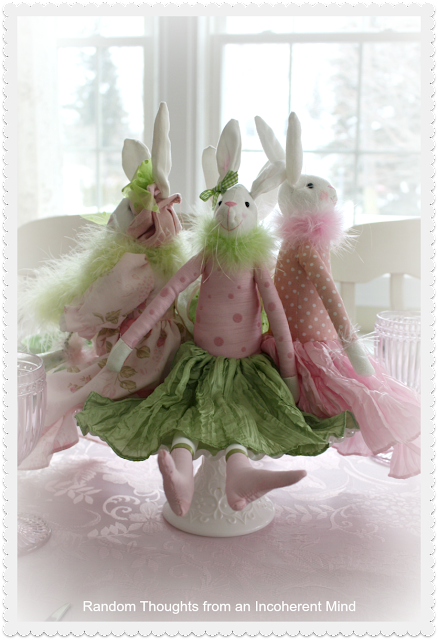 I adore the bunny ladies and the pink and green just screams SPRING! I love how you can bring in elements from all over and get them to look adorable together. Great job, as usual, Gina! Have a wonderful Easter! I just love your lovely bunny ladies! They're so adorable! All the colors look so pretty, too! They ARE very lovely indeed. One of my favorite tables scapes of yours, I love it. The "Ladies" are adorable, and your table is just so sweet and charming. 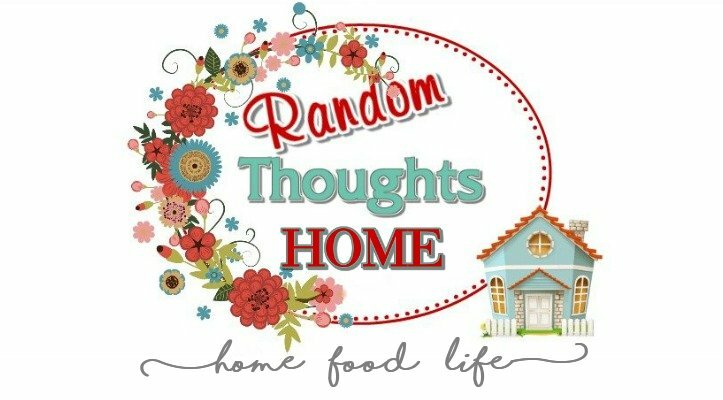 Love your dishes! Love those ladies and I am so glad they are behaving!!! Your table is soooooo cute and pretty, perfect for Spring.....if it ever gets here!!! Oh Gina, what a perfect table setting and the bunnies are adorable, I love pink and green! Oh, maybe these lovely ladies would like to be friends with Ms. Lilly Bunny...Hee, Hee, Hee. Another sweet tablescape. OH my stars your table is exquisite Gina. The light green and pink are so pretty together, we could all believe Spring is somewhere around teasing us. How lucky to be able to borrow the lovely ladies from your Mom. Think I'd have a hard time returning them. Love, loving your table. It's so happy and festive! 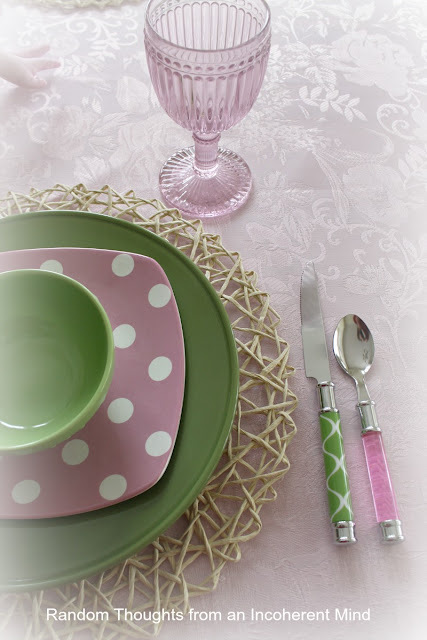 I love a pink and green combination anyway, but those particular shades and patterns really appeal to me. And the bunnies in the center are adorable. Gina - now, I see what you get your "eye" for tablescaping. Your mother's lady bunnies are adorable! You did a fantastic job of featuring them and using their pink and green palette. I love the new pink glasses and all of the flatware. I have a Hobby Lobby in town close by, but I have never seen anything as cute as those polka dot plates. I need to shop there more often Love this table!!! 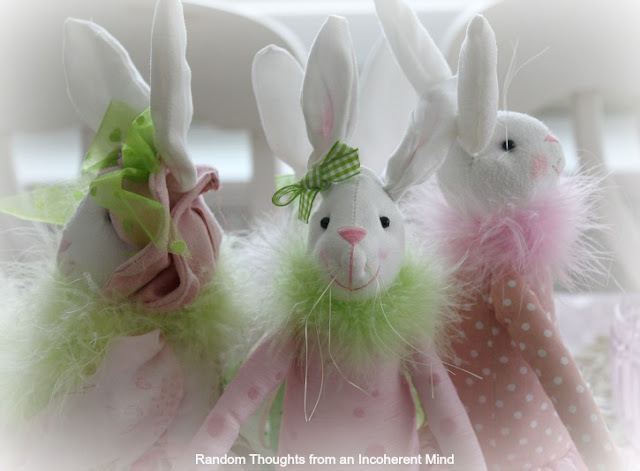 Your Eastertime tablescape is adorable! The lovely ladies...and those new goblets...precious and beautiful! You built a fabulous table around those fun lady bunnies! What cute little bunnies and the tablescape is so festive! Okay I told you last time I loved your whites - but I really really love this bunny setting. It is gorgeous and precious and I love those lady bunnies. I want them!!! The pink and green ladies are so adorable! And you table is as sweet as can be! Gina, I saw those bunnies on another blog and thought they were so darling. I love how you used them in your tablescape. I love pink and green for Spring. Beautiful dishes. I love the polka dots, the new glasses, and the fun silverware. The bunnies are adorable Gina and you table is gorgeous. Love the colors. Love the placemats & the napkins & the flatware & the glasses &.........heck....ALL. 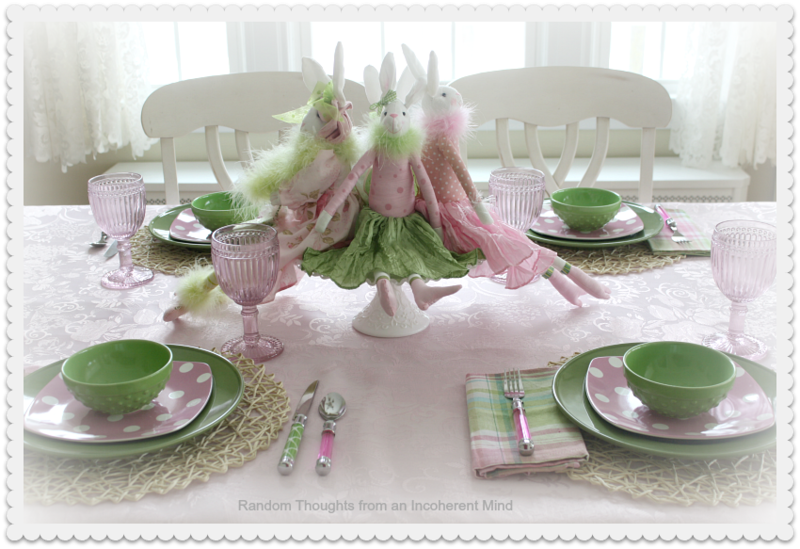 What pretty bunnies and a lovely tablescape in green and pink. I think that color combination is just pleasant to look at. Okay Gina....this is my favourite of all time!!! I love it. Those bunnies are adorable and so are the polka dot plates. Gina!!!! How ute, I love the pink and green of it all! Such cute bunnies. LOVE your table, my friend. Pink and green are my favorite colors, and I love the decorations this time of year. I suppose with that you can guess how much I love your sweet table. It is just wonderful! Awwwww Gina, this is precious! I think you've outdone yourself this time. I love your new pink goblets:) Have a wonderful Easter! Oh these girls are stealing the show. So cute on the table! Your table is so soft and beautiful and great pink goblets. ADORABLE Gina!! You always create such pretty tablescapes! This is such a beautiful spring-time table. I love it! Oh G! I had a little frog man like those and got rid of it :( I should have given it to you!! The table looks so pretty, your new pink goblets are darling. Super duper cute. Just beautiful! And those bunnies are so so cute!!! 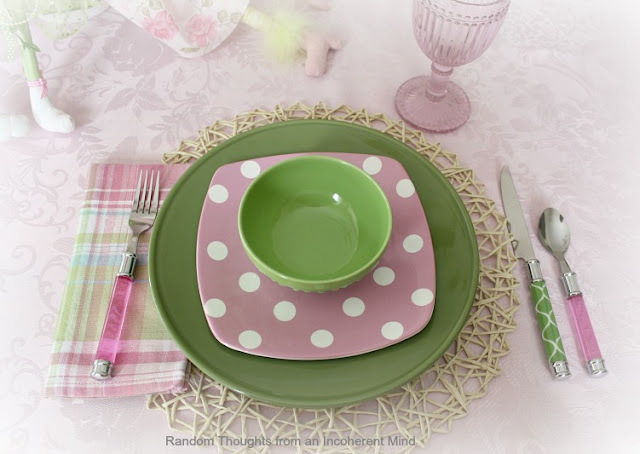 I love your tablescape with the pink and green! This is just precious! I looked to see if you had linked this up and you didn't! I thought I had missed it somehow. Those bunnies are so sweet! Great job!